Thank-you to beranekp@Flickr for submitting today’s image for Botany Photo of the Day (original image | Botany Photo of the Day Flickr Pool). 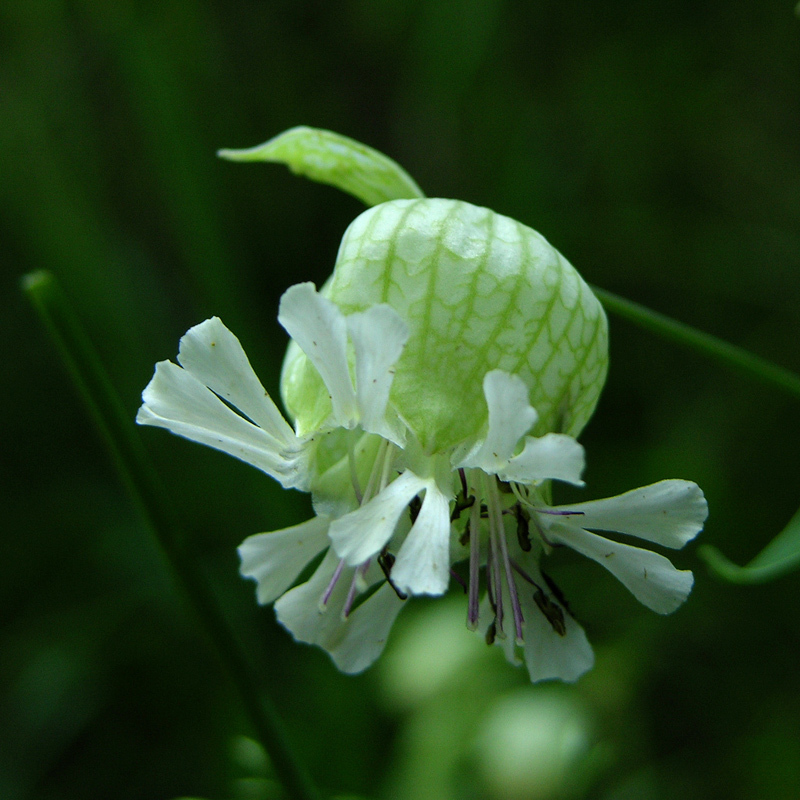 Commonly known as bladder campion, this species native to most of Europe is recognized by its balloon-like pale green calyx (veined with dark green or red) and its hairless leaves. Silene vulgaris was eaten as a starvation crop–the tender new leaves are similar to spinach and were eaten raw, boiled or fried. In the La Mancha region of Spain, bladder campion was used to prepare a dish called “gazpacho viudo” (or widower’s gazpacho). This dish was eaten when meat was scarce, and so named because this essential ingredient was missing. This is one of several campions introduced to North America from Europe, where it has subsequently become invasive in some areas. However, Silene vulgaris is quickly gaining status in Europe as a plant used in mine reclamation, as populations in parts of Wales have evolved with high copper polluted mining operations and can now process high levels of heavy metal in its soils. Researchers have found that the tolerance is retained in propagated plants and are now assessing the potential to use Silene vulgaris in other parts of Europe where mining has polluted the soil. I still pinch the flower in my fingers & pop it on the back of my hand! They make me think of can-can girls’ pants! Reminds me of a miniature jellyfish. Delightful! Was not aware of this plant. Thanks! Very interesting to see discussions of “weeds”- they all have such interesting properties, and surprising benefits! Watch out for this extremely aggressive and deeply rooted little thing ! I am still trying to pull it out of areas where it is not welcome. It also has a great tendency to pop up into the center of other, more welcome, plants. It did not know that this lovely plant was considered invasive. While I live in a neighborhood …I think lawns are way overrated. Would the leaves still be edible when the plant is growing in a heavy metal-contaminated area? I have a friend who is a great gatherer of weeds which she makes into delectable salads. We don’t, as far as I am aware, have this little one in NZ, but she’s Ukrainian, and there may be others of her background who would be using plants like this. This is actually an abnormal specimen of Silene vulgaris – see how there are two/three sets of floral parts fused? We see this type of developmental mutation occasionally, but it is not the norm. Typically there is one set of floral organs per flower. Thanks for sharing Silene vulgaris – my lab at the University of Virginia thanks you! Actually, I had this around my house (NH) and pulled it out over a couple of summers and then never saw it again. Now I miss it.